U.S. Sen. Bob Menendez announced Friday the U.S. Coast Guard has granted his proposal for marine traffic restrictions on the Hackensack River to mitigate the risk of a Portal Bridge failure that cripples the entire Northeast Corridor, impacting hundreds of thousands of commuters. Newark Mayor Ras Baraka touted a marketing campaign Thursday through the Greater Newark Convention and Visitors Bureau as a key to making Newark Liberty International Airport the focus for bringing tourists to Newark. New Jersey’s transportation lawmakers are eyeing a so-called “user fee” to fund the Transportation Trust Fund, as many people opt for electric and fuel-efficient hybrid vehicles instead of gasoline-powered cars on which the fund relies for money. U.S. Reps. Josh Gottheimer and Peter King introduced a bipartisan bill demanding a plan for a doomsday scenario if one, or both, of the two North River Tunnels is shut down beneath the Hudson River. 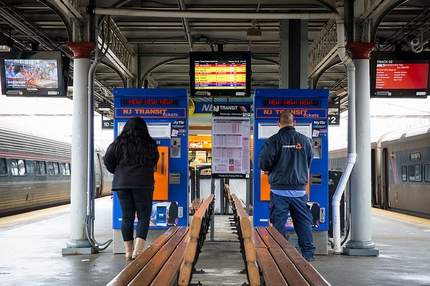 Sen. Nicholas Scutari is proposing legislation that would require New Jersey Transit to conduct a feasibility study on restoring the one-seat ride from the Raritan Valley Line to New York City, which was interrupted last fall for repairs. The buses will operate until Atlantic City Rail Line service resumes on May 24. The purchase expands the fleet of railcars owned by Instar and is the largest purchase by the company since its inception in 2016. The $38.6 billion budget for the 2020 fiscal year, calls for $100 million more for the state’s transit agency budget, which would amount to a net revenue increase of $25 million as most of the proposed funding just money that would not be diverted away from the agency's budget. Gateway Program Development Corp. Trustees Jerry Zaro, Tony Coscia and Steven Cohen announced Monday their backing of a proposal by U.S. Sen. Chuck Schumer to enable individual states to move forward with construction on projects in the pipeline for federal funding with knowledge that they will be reimbursed. Senate Bill 1567 requires employers with at least 20 workers to provide pre-tax benefits for commuting expenses, which advocates say will encourage workers to take public transit and save riders money.